Your Next Stamp Challenge #13~Purple!!! Such a sweet card Kerri. I really like these colors together. I'm also starting to like these images from YNS they are so cute! I think I'm going to have to get one soon. AWWW Kerri this is sooooo darling, LOVE LOVE the way you used these colors, the borders, and the beautiful ribbon!!! Darling image too!!!! I love that dp!!! Fairy Fhiona looks wonderful all dolled up in purple with sparkly wings! I really like how you've layered the lace boarder too! Oh, and your stitching is awesome!!! What a sweet and cute card Kerri, really wonderful! Very pretty. Avery and I like it! Wonderful layout, and use of your punches!! I love the adorable image and your coloring! She is so sweet! Love how you layered the lace punches! The whole layout of the card is so wonderful! 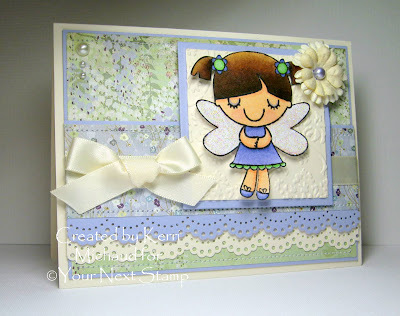 Ohhh she's so sweet with her sparkly wings....love that you made her nice and bold with the dark hair and all to contrast such soft colors in the papers. Such a sweet image. I love the softness of the colors. Great textures. Awww, so pretty with the Almost amethyst - one of my favorite soft colors! Love the sparkle on her wings!